I think the thing that has surprised me most about blogging is how social it really is. There’s a great network of support from other foodies and it’s fun when we can come together to celebrate important milestones. Today we’re celebrating the 15th wedding anniversary of Camilla and her husband. Camilla is always hosting some kind of party on her site, Culinary Adventures with Camilla, and they’re always fun! Instead of traditional cake at their wedding, they served cheesecake. She asked some bloggers to help celebrate this milestone with delicious cheesecake. I quite enjoy cheesecake but rarely ever have it. In fact, I’ve only made cheesecake once! I started looking through my favorites save on foodgawker. While I wanted to push that little heart all over again on just about every cheesecake I couldn’t pull my eyes away from this mudslide cheesecake. Kahlua, yum. Bailey’s, yum. Chocolate, yum. Instead of making a chocolate sauce to top my cheesecake, I decided to use chocolate graham crackers in the crust. I really think that decision makes the cake. Well, the kahlua and bailey’s don’t hurt anything. I used my homemade Irish cream and some homemade kahlua I got from one of my bowling teammates. This cheesecake is so rich and smooth that there’s no way it needs a sauce. Even my husband, who thinks he doesn’t like cheesecake, devoured a slice or two of his own. Congratulations on 15 years of marriage, Camilla! Preheat oven to 350 degrees F. Place a casserole dish full of water on the bottom rack. In a bowl, mix together graham cracker crumbs, 1/4 C sugar, and the melted butter. Press crumbs into a 9″ springform pan, pressing up the sides. Bake 8-10 minutes. Set aside. In the bowl of a stand mixer, beat the cream cheese and sugar. Add the eggs, one at a time. Mix in the vanilla extract. Divide filling into two bowl. Mix the Kahlua into one half of the filling and the Bailey’s in the other. Pour the Bailey’s filling into the springform pan. Top with the Kahlua filling. Bake 40 minutes. Turn off the oven and crack the door for 15 minutes. Remove from the oven and cool completely before placing in the refrigerator to chill for several hours before serving. 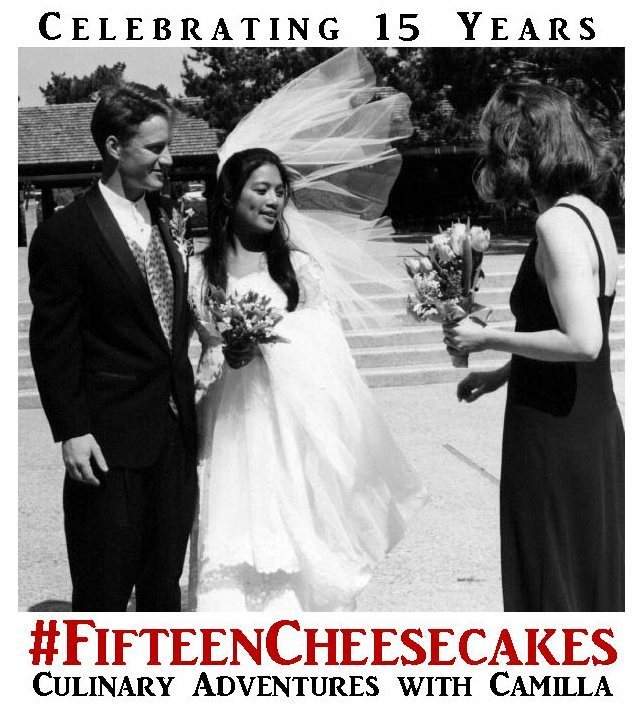 Check out this list, that’s much longer than #FifteenCheesecakes to help Camilla celebrate! What a pretty cheesecake! The flavors sound wonderful and a perfect sweet treat. So. Dang. Good! Loved the chocolate crust! Kahlua and Baileys??! Yes! This looks perfect and sounds awesome! Oh my gracious! I’ll take the whole cheesecake, please! yum!!! A boozy cheesecake? A girl after my own heart! Thank you for the recipe…and for helping me celebrate. I’m so excited about all these new cheesecake recipes to try. OH MY GOODNESS….this looks absolutely perfect. Me too. I was ecstatic at how perfectly it ended up. I was nervous. Oh my heck! Yes, please! Looks amazing. I definitely need a slice of this one – sounds SO good!! You probably do, it’s so good! I love, love, love Mudslides! This cheesecake looks amazing. Great choice for Fifteen Cheesecakes. Yum, this sounds awesome! I will definitely have to try this. I also don’t make nearly enough cheesecakes. I love how you decided to make a chocolate crust, instead of chocolate sauce. Cheesecake is rich enough as it is, it doesn’t need any sauce! It sounds amazing.